TARLAC CITY -- In partnership with Department of Energy, all 72 SM malls nationwide including SM City Tarlac joined in observing Earth Hour to inspire communities to take a stand against the indiscriminate threat of global warming and make a commitment to a low-carbon lifestyle by switching off non-essential lights from 8:30 p.m. to 9:30 p.m. last March 30. Earth Hour 2019 was graced by Provincial Information Officer of Provincial Environment and Natural Resources Office Ma. Teresa Samson; Head of City Economic Enterprise Management Office Dr. Mina Tanedo; Council Scout Executive of Boy Scouts of the Philippines Salve Aguilar; Community Development Officer of ENRO Bren Tuazon; and Head of Tarlac Mountaineering Club Alvin Timbol. The event was also especially participated in by members of the Armed Forces of the Philippines, Philippine National Police, Boy Scouts of the Philippines and Tarlac Mountain Bike Club. 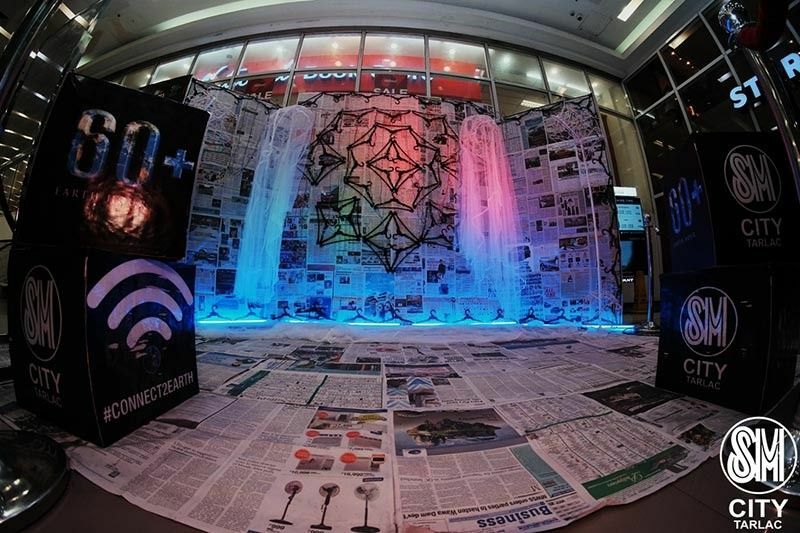 In this year’s Earth Hour celebration, SM City Tarlac emphasized the need to take active participation in environmental initiatives concerning the grave threats to marine biodiversity - conveyed in an artistic installation using old newspapers and other recycled materials. With this, everyone is encouraged to be his own environmental warrior in saving aquatic resources through recycling. The spirit of unity in the global celebration of Earth Hour was also highlighted during the event through illuminating art and performances. The partner organizations also vouched to promulgate environmental awareness. According to SM City Tarlac mall manager Engr. Darrel Ramos, it has been 10 years since SM Supermalls participated in the annual Earth Hour program. He also stated that SM has been placing environment and sustainability at the forefront of each operation. Aside from supporting Earth Hour, SM has also been taking sustainability initiatives that include water recycling; air quality and flood control; solar powered rooftops and LED powered lights for energy efficiency and conservation; responsible solid waste management efforts through the regular Trash-to-Cash activities where the public can exchange specified recyclable or reusable trash for cash.